The first “Album Of The Month” and it has to be ‘Prostitute’. Not only for being a great album but also for including the song that this new Toyah Newsletter takes its name from. Released in 1988, I think this album shocked every Toyah fan at the time. It was the successor to ‘Desire’ and couldn’t have been more different but also that title. Tame by today’s standards maybe, but in 1988 it was still a word that Toyah couldn’t even say when she guested on TVAM. 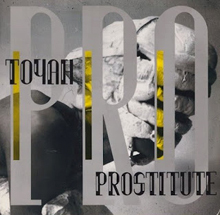 ‘Prostitute’ is definitely Toyah’s most experimental album to date, and her least commercial. Using all manner of samples and noises to create a weird, yet addictively interesting, soundscape. It’s minimalist and raw and has Toyah sounding quite like Kate Bush in parts, Laurie Anderson in others. There’s an abundance of spoken and whispered vocals and Toyah’s unmistakable laugh and in comparison to its two predecessors; ‘Desire’ and ‘Minx’ is almost a return to the brashness of Toyah’s early Safari albums. Go on, give ‘Prostitute’ another listen… View more here.